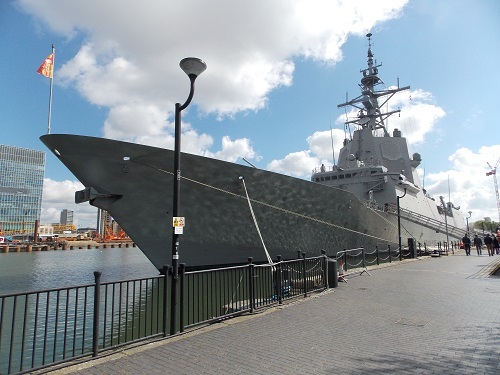 One of the benefits of living near West India Dock is that when there is a ship visiting, they often have Open Days when you can undertake a tour of the ship. 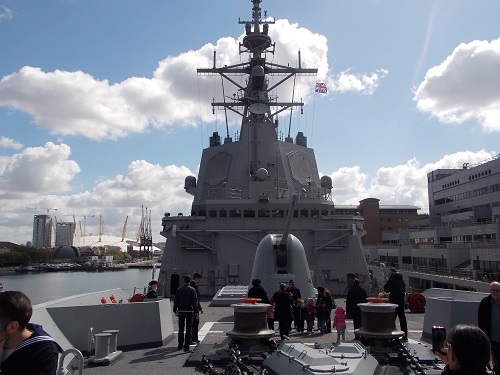 Today the Spanish Navy frigate Méndez Núñez is open to the public from 10.30 am to 1.30 pm. 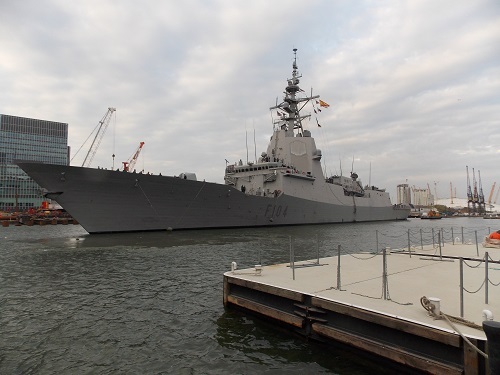 When I watched the ship come into dock, she looked larger than many of the other frigates who have visited and once you get on board that initial feeling is confirmed. It is 147 metres long with a beam of 17.5 metres with a depth of 9.8 metres. 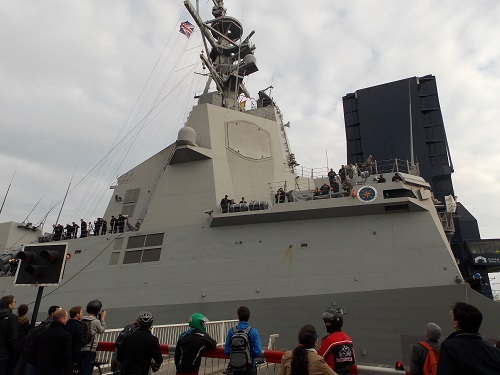 The ship has a of 201 plus 36 Air crew and staff. 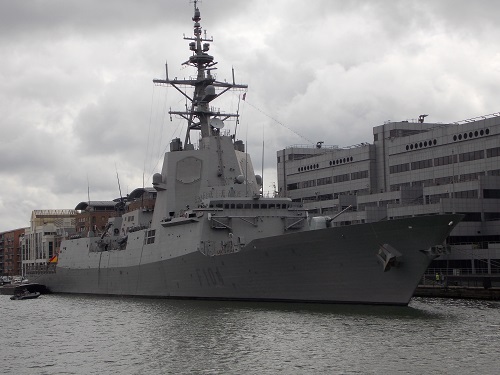 The Méndez Núñez (F104) is a Álvaro de Bazán class frigate which was built by Navantia in its Ferrol Shipyards and was launched in 2004 and entered service in 2006. 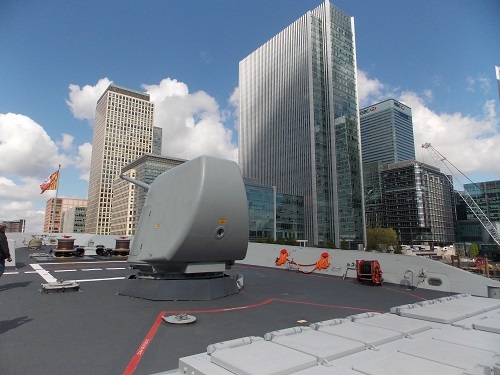 The ship is relatively new and possesses lots of state-of-the-arts technology designed for anti-air warfare. 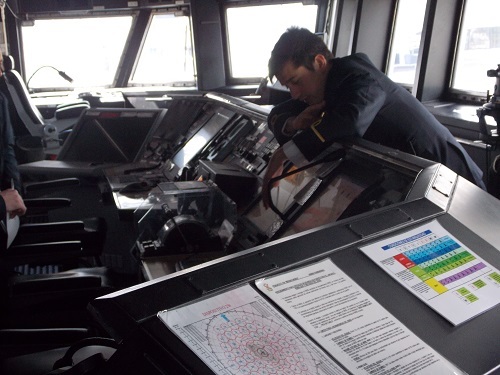 This is most obvious in the rather spacious bridge with a number of screens and displays that offer views of most of the systems on board. 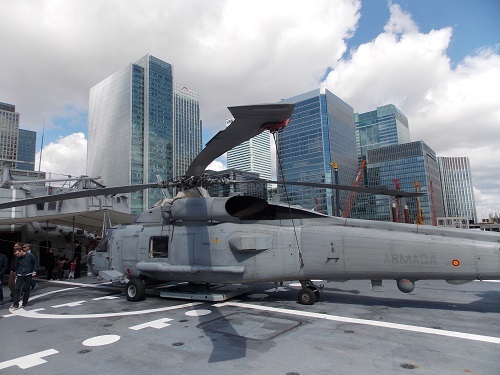 It operates under the AEGIS combat system with Radar, Torpedoes and Sonar, it also has the capacity for a Seahawk Helicopter. 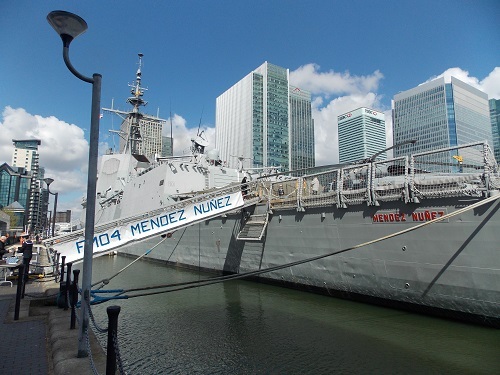 The ship will be leaving the dock this evening, so if you would like to see Méndez Nunez , you will need to quick. On a cold and damp morning on the Isle of Dogs, there was still plenty of expectation as people awaited the arrival of the 2015 London Marathon. 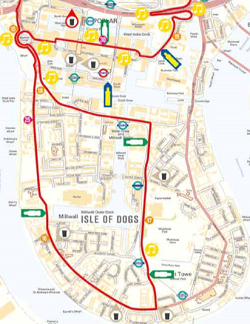 One of the benefits of watching the race on the Island is that you can watch the runners go down Westferry Road and watch them return on Marsh Wall before they go into Canary Wharf. 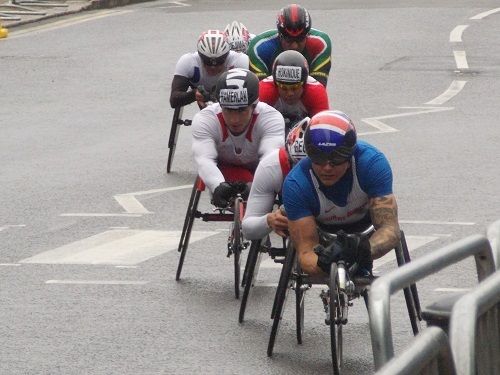 The first part of the Marathon features the elite athletes and it was the wheelchair competitors who made the first appearance with six time winner David Weir leading the pack. 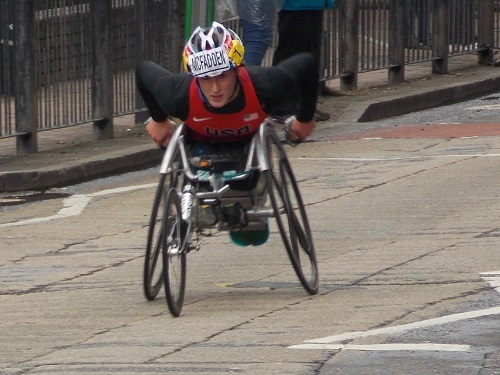 In the women’s race, the favourite, American Tatyana McFadden was already well in the lead as she reached the 18 mile post. Next to arrive were the IPC World Championships which featured contests for visually impaired athletes and single leg amputees. 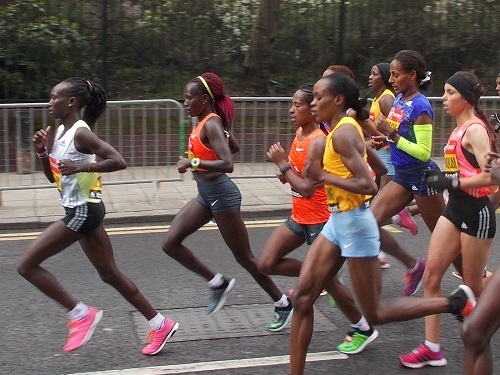 All the main competitors were at the front when the elite women arrived, Edna and Florence Kiplagat, Mary Keitany and Priscah Jeptoo are the top four women marathon runners in the world and were expected to contest the finish. 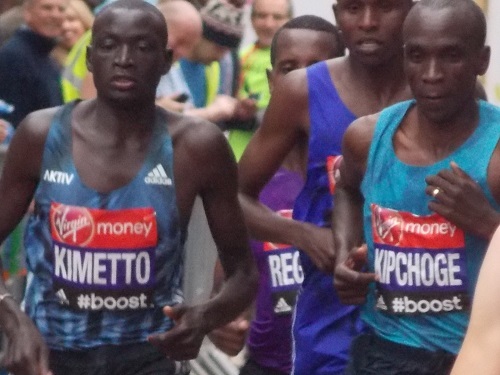 In an equally strong field for the men’s elite field In the men’s race, Reigning champion Wilson Kipsang, world record holder Dennis Kimetto was joined at the front by Eliud Kipchoge and Stanley Biwott. 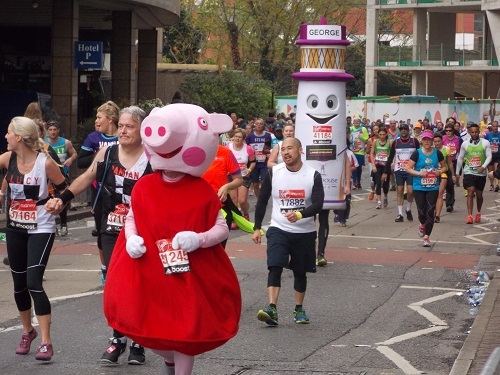 It is estimated that record numbers are expected to run the 2015 Virgin Money London Marathon on Sunday 26 April, after more than 38,000 registered for the race.The previous record was set in 2012 when 37,227 started and 36,705 finished the race. 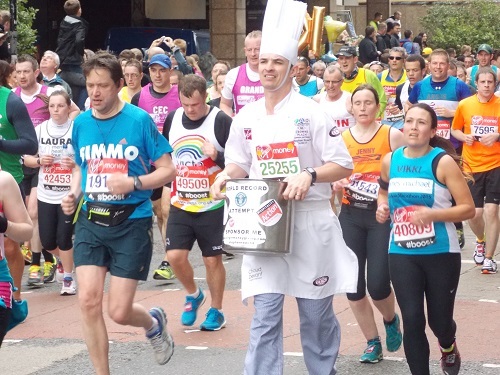 But what makes the London Marathon unique is the thousands of club athletes, fun runners, celebrities, and fancy dress costume wearers. 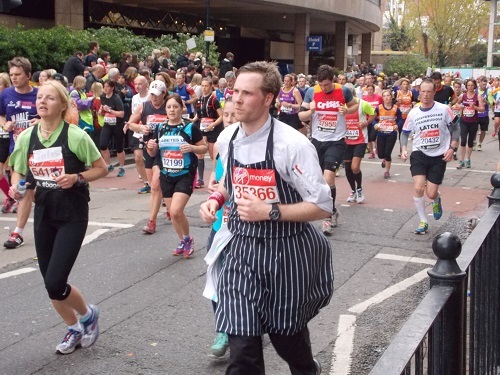 Millions of pounds are raised by these people who chase their own personal targets, whether measured in pounds raised, or hours, minutes and seconds on the clock. 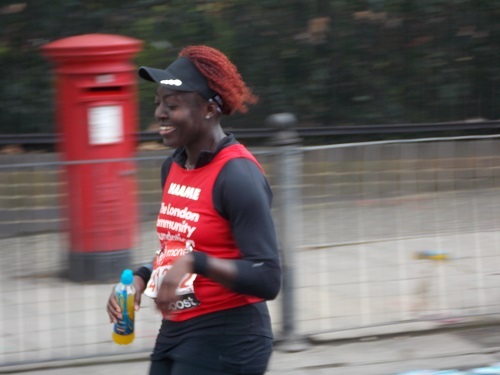 Each has their own story to tell of what has inspired them to undertake the gruelling 26.2 miles marathon, one example is Maame Baryeh who is running for the London Community Foundation who are trying to make a difference to the lives of Londoners by connecting people who need help with those who are willing to give, if you like to donate to this particular London cause, here is the link here . 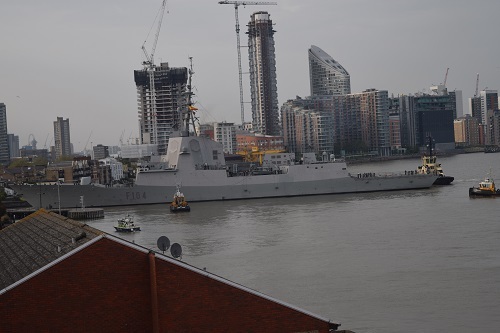 Over the last few weeks, there has been very few ships visiting West India Dock. 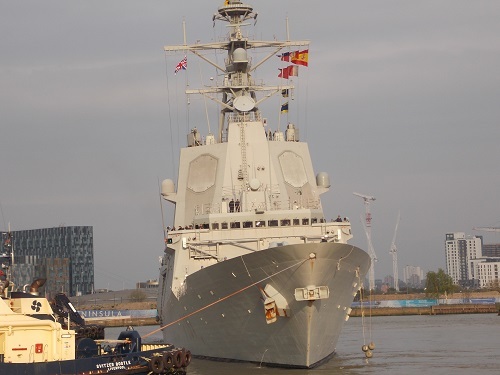 However the welcome arrival of the Spanish Navy frigate Méndez Núñez today offers more that a little interest. 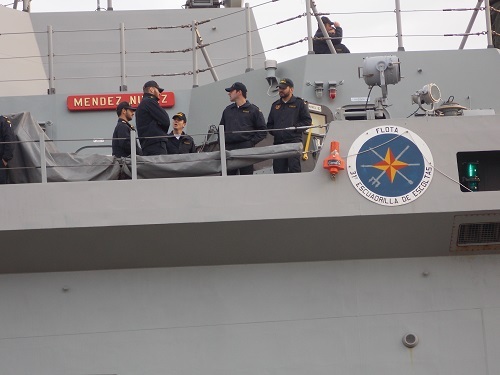 The Méndez Núñez has just returned from the waters off Scotland where the ship participated in a NATO joint training exercise called ‘Joint Warrior’ which was organized by the United Kingdom. 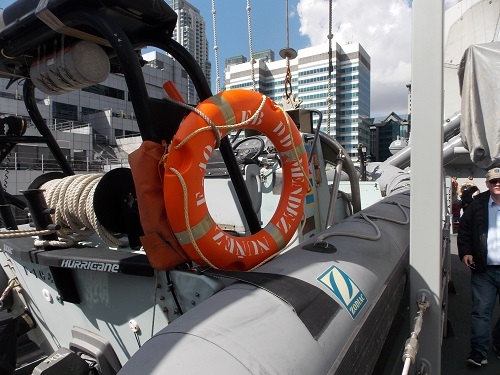 There has been a marked increase in these kind of manoeuvres since the beginning of the Ukraine crisis and ‘Joint Warrior’ included all three Services of a number of NATO allies testing their capabilities in a number of crisis and conflict scenario’s. 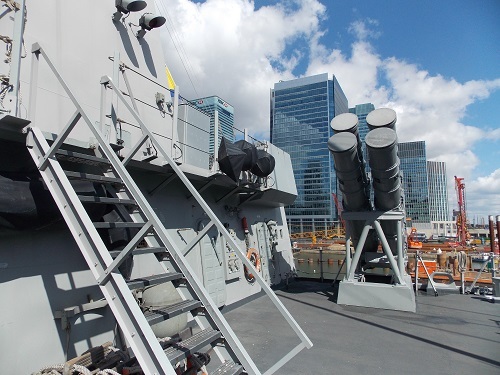 The F-100 frigates are especially designed for anti-air warfare using the AEGIS combat system which offers state-of-the-arts technology. 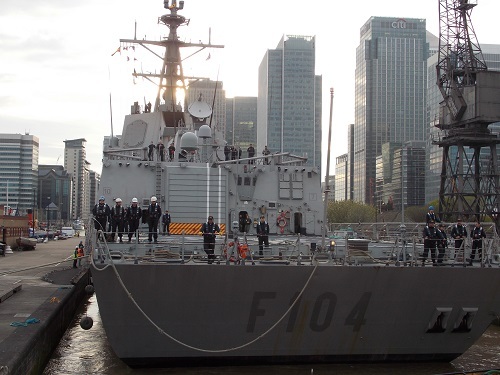 The ship has seen action in the Mediterranean and Indian Ocean mostly in an anti piracy and anti terrorism role. The ship has a crew of 200 people and will be here for a few days, there is no news if it will open to the public to visit. This year fields are considered the strongest to contest the race. In the women’s race, Edna Kiplagat ,a double world champion sprinted to victory on The Mall last year, beating Florence Kiplagat. The two Kiplagats will meet again in April when they face Mary Keitany, who won the London Marathon in 2011 and 2012. British interest will be centred on world record holder and three-time London champion Paula Radcliffe who will use the race to say farewell to marathon running. 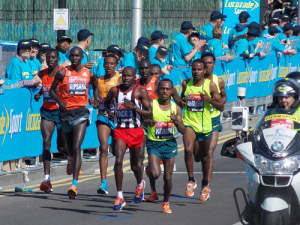 Whilst in the Men’s race, former world-record holder Wilson Kipsang will defend his London Marathon title against fellow Kenyan Dennis Kimetto, the man who made history last year when he broke Kipsang’s record to become the first man ever to run 26.2 miles in less than two hours three minutes in last year’s Berlin Marathon. Kipsang will be attempting London Marathon history by becoming only the fourth man in the event’s 35-year history to claim a hat-trick of London titles. The Kenyan pair are just two of the great runners in a men’s elite field which include the legendary Ethiopian Kenenisa Bekele, the triple Olympic track gold medallist, and multiple world-record breaker. Some of the benefits of watching the Marathon on the Isle of Dogs is that you can actually watch in comfort rather than being part of the massive crowds in Greenwich and Tower Bridge. You also have easy access to the Transport system and access to many pubs and bars, restaurants. 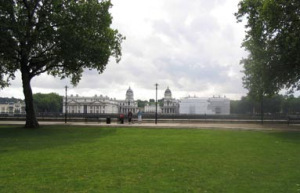 In recent weeks, I have written about the various buildings around the Isle of Dogs, however they are not the only accommodation available on the Island. Lying in Millwall Dock is a number of large houseboats that offer a very different style of living. 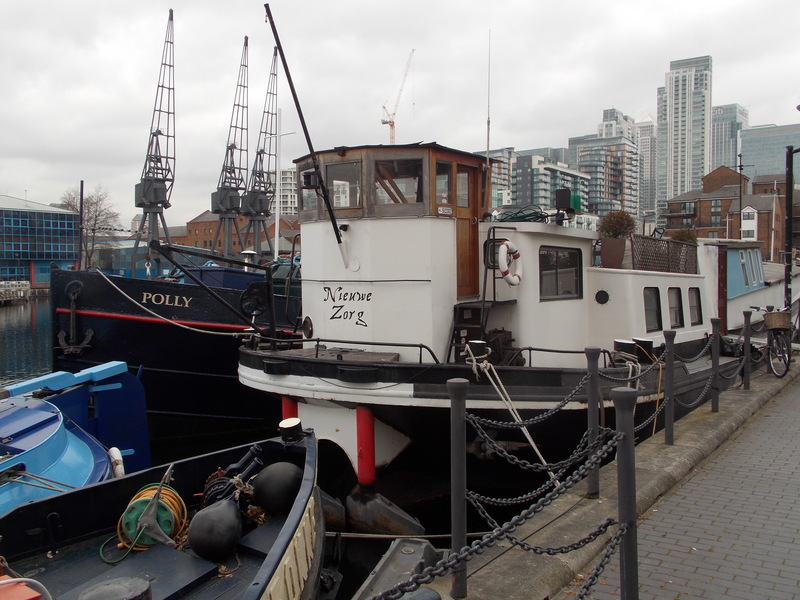 Most of the houseboats seem to be Dutch in origin and have been a familiar sight in the docks for a number of years. However even this style of living is not cheap with the boats often costing £200,000 or above. 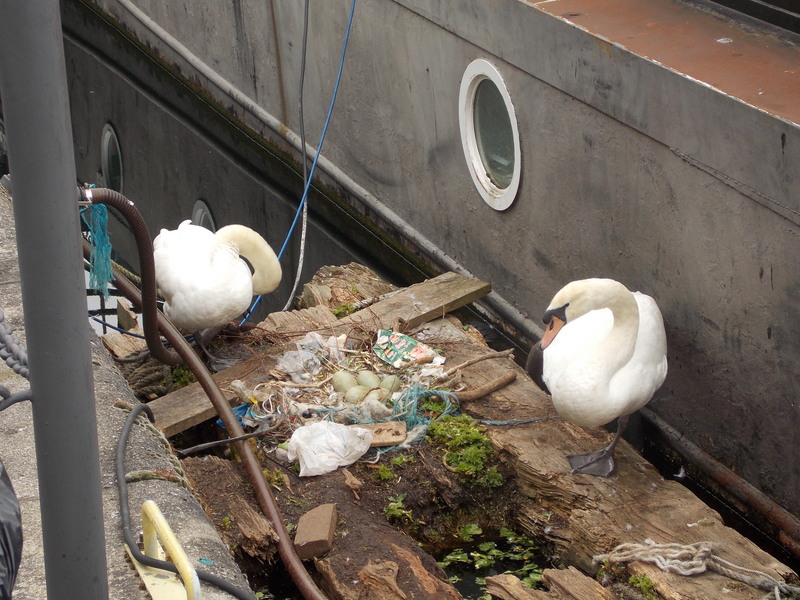 Most of the boats have not moved for years and attract their own particular wildlife, a pair of swans often nest and lay eggs amongst the boats. 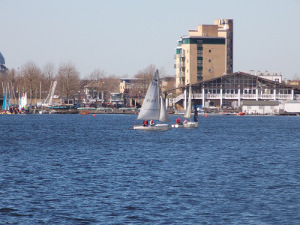 With the houseboats and when the small yachts go on the water from the Docklands Sailing and Watersports Centre, Millwall Docks can be a lovely picturesque sight. However dotted around the docks are reminders of the days when it was a working dock. The Millwall Dock was constructed by John Aird & Co. to a design by Sir John Fowler and opened in 1868.It originally contained around 36 acres of water and had a 200 acre estate. 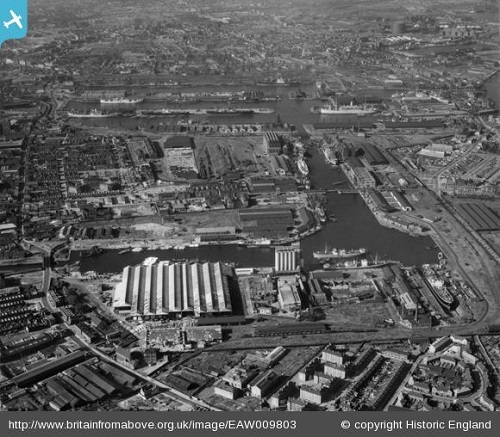 The western end of the Outer Dock was originally connected to the Thames at Millwall by an 80 ft wide channel. 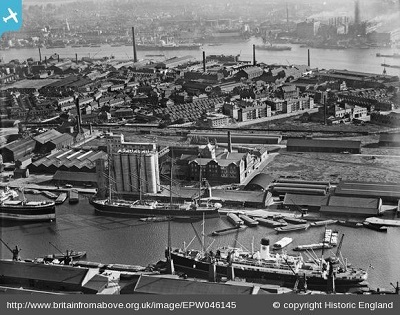 However in the 1920s, the Port of London Authority connected the northern end of the Dock was connected to the West India Docks and closed the direct connection with the Thames. The dock was used mainly for timber and grain, one of the features of the dock was a massive McDougall’s flour mill which was demolished in the 1980s. It also had a dry graving dock to undertake repairs. The Millwall Dock of today may not have the big ships but it still maintains its own unique style and charm. Whilst it was once a place of frantic activity, it is now a place of peace and leisure and is very popular with office workers and Islanders who enjoy sitting around the dock especially in warm weather. 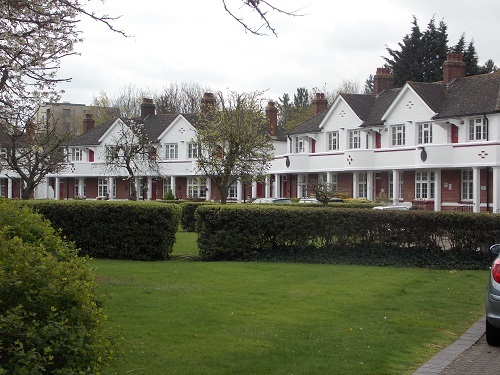 The Isle of Dogs is a collection of all kinds of buildings, however Jubilee Crescent is unusual in many ways. 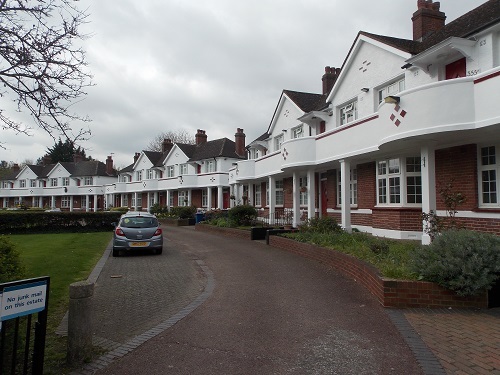 Built in 1935 by architect G R Unthank, Jubilee Crescent is a very attractive group of properties that stand in their own landscaped grounds. 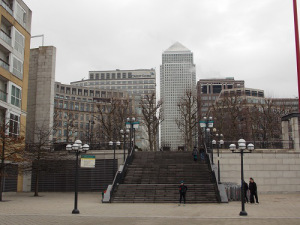 They have that sort of 1930s design that would not look out-of-place in the suburbs but represents quite a different design for the Isle of Dogs. The story behind the building of the crescent is tied into the Island’s history of ship building and the philanthropic works of one the largest local firms. Local ship repairing firm, R. & H. Green & Silley Weir Ltd were based in Blackwall and were part of a long shipbuilding tradition. R. and H. Green Ltd was formed from the old-established Blackwall firm of Wigram and Green who were famous shipbuilders in the 19th century, however with the decline of Thames shipbuilding in the early 20th century, R. & H. Green became part of ship repairing partnership called R. and H. Green and Silley Weir. 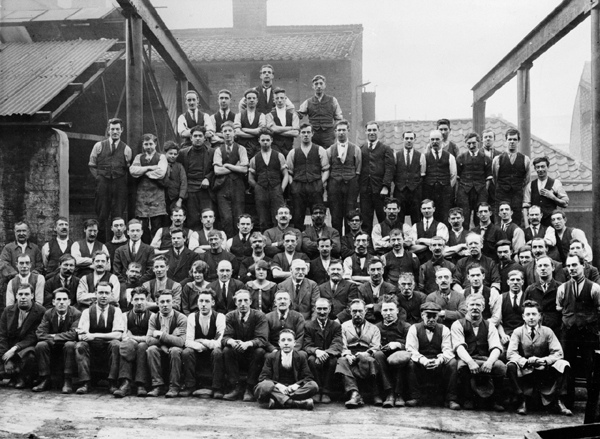 It was the chairman of the firm, John Silley, who was determined to provide homes for retired workers of the shipbuilding and repairing industries. Silley had already built some dwellings for his workers in Falmouth and chose the Isle of Dogs to build a series of dwellings that would mark King George V’s Silver Jubilee. 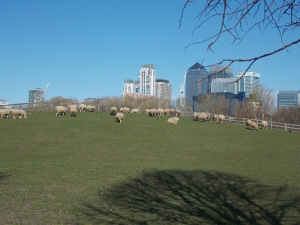 Silley approached the Port of London Authority and persuaded them to give him 1.5 acres on the edge of the Mudchute in exchange for some land owned by his firm at Beckton. The firm then provided the money to build the flats and then handed them over to a trust – the Shipworkers Jubilee Housing Trust – which initially let the dwellings at 2s 6d per week. The scheme received a State housing subsidy, and Poplar Borough Council co-operated by charging a special inclusive figure for the costs of rates (at a nominal assessment of £3 per house), electric light, and water rates, so that these could be covered by the rent. The crescent got its name because it was built-in the year of the Silver Jubilee of King George and Queen Mary. 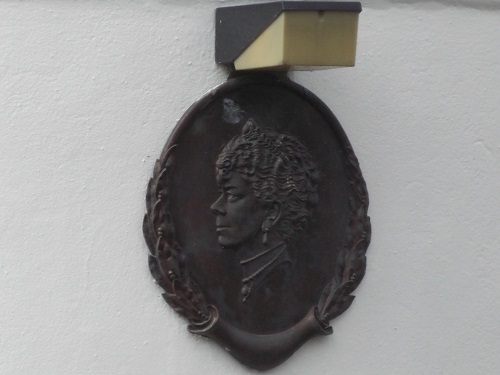 There are two reliefs of the King and Queen on the front of two houses in the crescent. 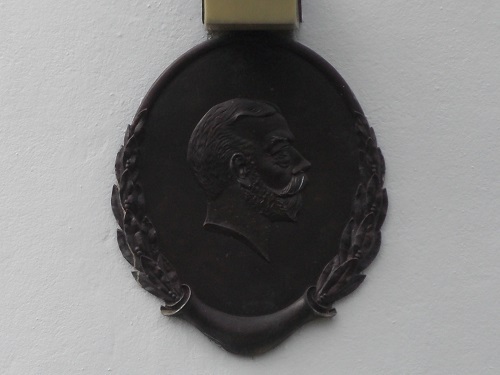 John Silley was a committed Christian who contributed toward the YMCA and numerous other charities, however although Green and Silley Weir still had 8,000 employees in the 1960s, the firm went into decline and in 1977 was sold to become part of the Government-owned River Thames Shiprepairers. 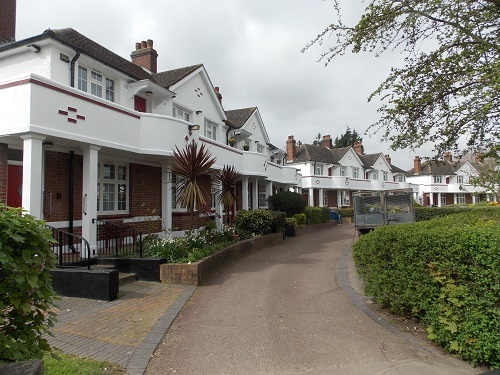 Amazingly, although the firm has now disappeared, Jubilee Crescent managed to avoid the bomb damage that blighted this particular area in the war and still provides very attractive accommodation for retired people and is managed by a housing trust. 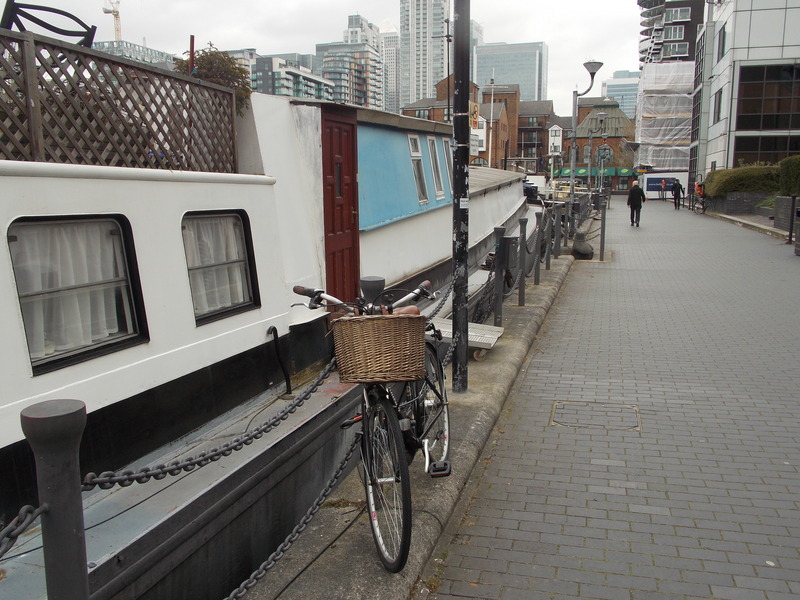 One of the most interesting parts of writing and researching about the Isle of Dogs is that you often come across connections which are no means obvious. Recently I came across a newspaper report about Cleopatra’s Needle which illustrates this point. For well over a hundred years, Cleopatra’s Needle has been one of London’s landmarks on the Embankment but the story of how it was transported to London is fascinating and has a number of connections to the Isle of Dogs. Cleopatra’s Needle is an Ancient Egyptian obelisk made during the reign of the 18th Dynasty Pharaoh Thutmose III in around 1450 BC. The obelisk was moved to Alexandria by the Romans in 12 BC, where eventually it toppled over and remained until 1877 when Sir William James Erasmus Wilson sponsored its transportation to London from Alexandria at a cost of some £10,000. The question of transportation was a problem, it was too expensive to transfer by land and the British Government did not want to get involved in any way. The solution proposed by engineer John Dixon was to encase the obelisk in great iron cylinder, 92 feet (28 m) long and 16 feet (4.9 m) in diameter. The creation of the iron cylinder was undertaken by Thames Ironworks in Blackwall who specialised in unusual constructions. Somewhat bizarrely on the top of the cylinder was a deck house, masts and a small set of sails. 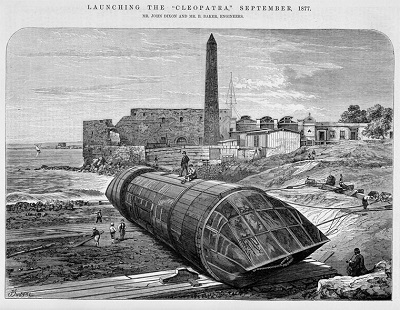 The cylinder named The Cleopatra was transported to Alexandria in parts and reassembled on the beach under the supervision of John Dixon and Captain Henry Carter who was to command the ‘ship’ whilst being towed behind a steamship. Eventually the obelisk was encased in the cylinder and attached to the steamship Olga for its journey to London, all went well until 14th October 1877, when a storm in the Bay of Biscay caused the cylinder to start rolling, The Olga sent out a rescue boat with six crew, but the boat capsized and all six crew were lost. Captain Carter and the five crew members aboard the Cleopatra were eventually rescued, but the cylinder was feared to have sunk. However these fears were unfounded and the cylinder was found and was taken to Ferrol in Spain. Unfortunately this was not the end of the problem because over £2,000 salvage had to be paid before the journey could be continued. 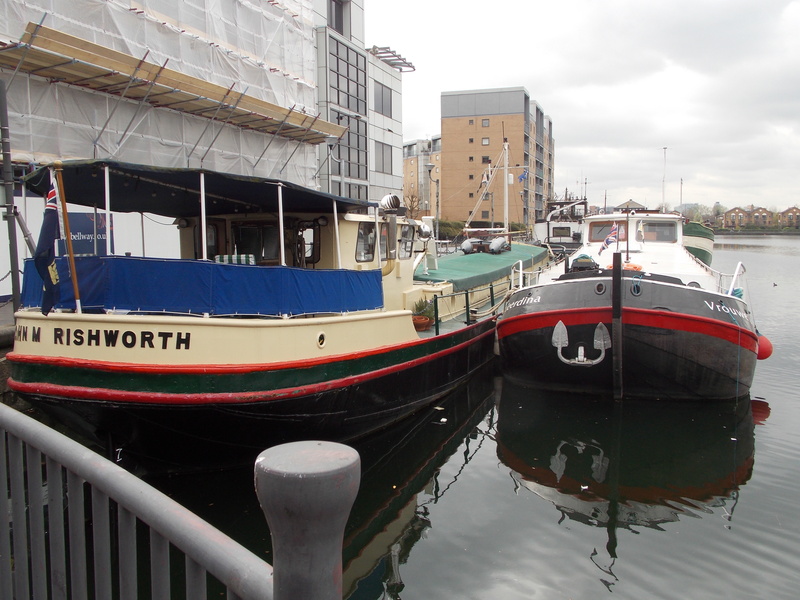 The money was eventually paid and the William Watkins owned paddle tug Anglia (which was also built at Thames Ironworks) departed Millwall to travel to Ferrol to tow the cylinder back to the Thames. 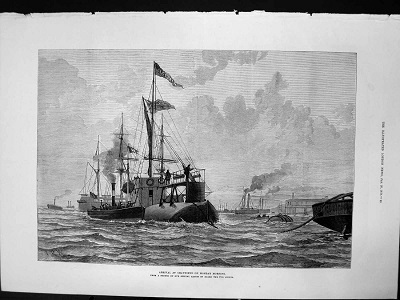 Thankfully this journey was without incident and the tug and the cylinder arrived in the Thames estuary on 21 January 1878. A newspaper report from The Times tells the next part of the story. CLEOPATRA’S NEEDLE. (The Times, January .) The Cleopatra with the Alexandrian obelisk on board was safety moored on Monday afternoon in the East India Docks. Every preparation was made for her reception by Mr Aslett, superintendent of the East India Docks ; Sir William Baynes, chairman of the East and West India Dock Company; Captains Marrable and J. Hales Dutton, dock masters; and Colonel du Plat Tayior, secretary of the dock company. It was resolved to give her the ‘railway berth,’ the best in the whole dock, just opposite the superintendent’s office. There was a great crowd at Blackwall, and much enthusiasm was evinced- as the afternoon tide approached high-water point, the time for which, According to the notification at the dock gates, was 3-35. Captain Saxby had foretold that it was to have been a very high tide, but it was much checked by a south-westerly wind. It was said that the Anglia, with the Cleopatra in tow, had left Gravesend at half-past twelve, an announcement which timed out to have been a little premature, as the start thenue was not made until 1. However, not long after the Anglia, with the Needle-ship in her wake, was seen from the Blackwall Railway Pier steadily approaching. She is an iron steam tug of 140 horsepower, and has three funnels, painted black, with a red band in the middle, and hoists a red flag marked W, like all those of the fleet to which she belongs. The fleet numbers a score of these powerful iron vessels, which must not be confounded with ordinary river and coasting tugs, but often make ocean voyages, as far, for instance, as St. Helena. The form of the floating cylinder with parallel pinched ends need not be again described. 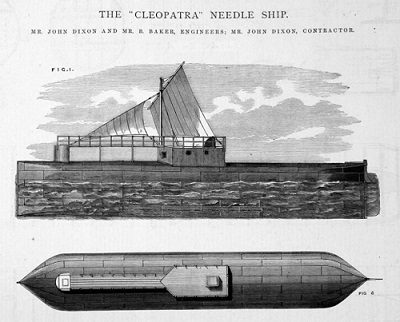 She is painted buff down to her water-line, and red beneath, carrying two red flags, of which the upper one bears her name ‘Cleopatra,” the lower being a simple British merchant’s ensign. Owing to the number of vessels leaving the docks, it was close upon three before the Anglia and the Cleopatra approached the dock gates, and it was a quarter to 4 before the obelisk ship was within them. 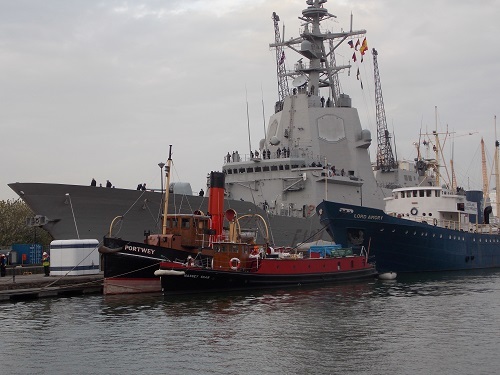 By this time the Anglia had resigned her charge to the care of the dock company’s tug Mosquito,which worked the Cleopatra safely and comfortably through the narrow entrance, and saw her to her berth, which, however, was not reached till nearly 5. Meanwhile the crowds continued to swell, and the excitement was very great. Order was admirably preserved, thanks to the arrangements of Captain Sheppey, the superintendent of the East and West India Dock Police. 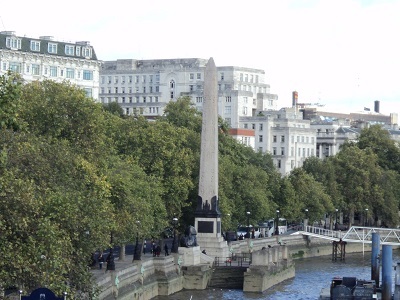 So the Cleopatra’s Needle’s first home in London was East India Docks until the decision was made where to erect it, The Palace of Westminster, St James Park and the British Museum were some of the suggestions but eventually the Embankment was chosen and well over 100 years later is where it still remains.